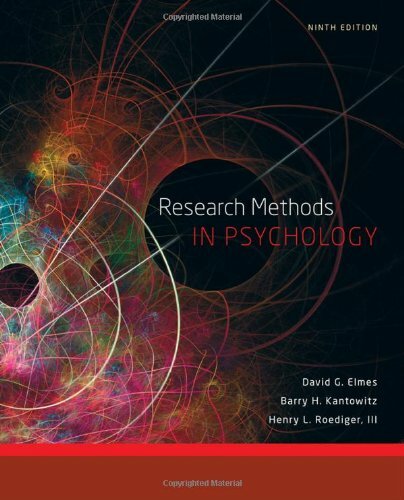 Using contemporary examples from primary sources, RESEARCH METHODS IN PSYCHOLOGY, Ninth Edition, encourages students to become engaged in the basics of scientific investigation through an example-based approach. This text displays the authors' commitment to ensuring that the student has a thorough understanding of the research process from the very beginning. Highly readable, it avoids the heavy statistical tone that some introductory students find difficult to understand. Rather, it is conceptually driven to offer students a big picture view of the experimental approach to research. Empirical examples and applications are consistently used throughout to foster critical-thinking skills. In many chapters, a unifying empirical example at the beginning of the chapter is cited throughout the chapter to help clarify terms or design problems. By presenting concepts with concrete examples, the text aids students in applying related ideas to their areas of research interest. Elmes, David G.; Kantowitz, Barry H.; Roediger, III Henry L.